Not too long ago, the idea of a decades-old TV show getting a half-sarcastic/half-loving remake was met with a sizable mixture of groans and shrugs of disinterest. Then Todd Phillips’ Starsky & Hutch came out and—wait, no. Nobody cares about that movie. Then Phil Lord and Chris Miller’s 21 Jump Street came out and people realized that—in the right hands—a project like that could actually be pretty good. Apparently, though, those right hands belong solely to Lord and Miller, because Fox has just hired them to mastermind a TV remake of The Greatest American Hero. For anyone who missed that period in the ‘80s when something as supremely goofy as The Greatest American Hero could be on TV, the show was about a public school teacher who got a superhero costume from some aliens in the desert. Unlike most superhero costumes you get from aliens in the desert, though, this one actually gave him superpowers. The show also had a really great theme song, which is probably the only thing anyone remembers from it. 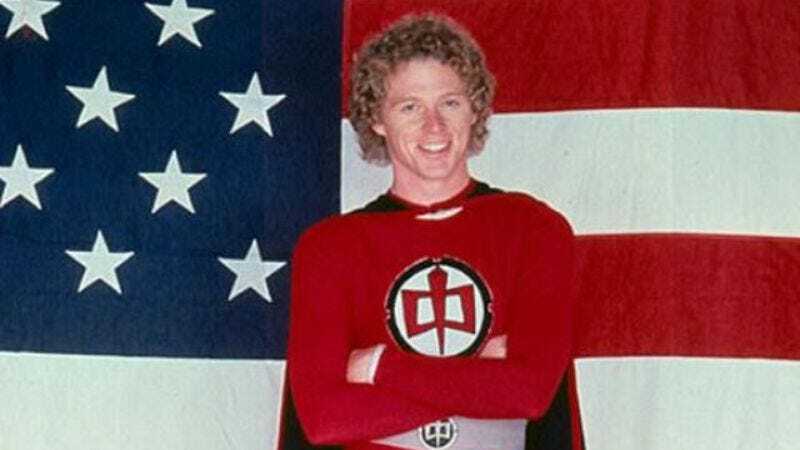 News of The Greatest American Hero being remade comes from Deadline, which reports that Lord and Miller are executive producing the show and that they’ve hand-picked 22 Jump Street co-writer Rodney Rothman to write it. Tawnia McKiernan—the daughter of Greatest American Hero creator Steven J. Cannell and a TV director in her own right—is also on board. Presumably she’ll be there to make sure this new series maintains the original’s legacy, which could be managed pretty easily by just not changing the theme song at all.